The two BGA teachers from the Saturday morning teaching session were the winners in the Cornish Go weekend's two tournaments. In the 16-player Cornish Lightning Handicap on the Saturday afternoon, Tony Atkins (2 dan Reading) was the winner in the final against John Culmer (1 kyu, West Cornwall) despite having to give a four-stone start. On the Sunday, Toby Manning (2 dan Leicester) won the 20-player Cornish Open. Again John Culmer was the player beaten in the last round. Toby collected the Devon and Cornwall Go Stone trophy, whilst Tony collected a new similar trophy (but serpentine and not wood) given in memory of a local player, Dominic Taylor, who had died recently. Cornish Open Tournament and Cornish Lightning Handicap Tournament results. Ivan Wong, a Chinese 1 dan research student at Manchester University, won the Northern Tournament on 5th September at the Stockport Masonic Guildhall. Unusually Ivan was the only player of the 24 there to win all three games and so was the only prize winner. Gerry Mills again brought the BGA bookstall, but for the last time. There were no British players winning Go Golds at this year's Mind Sports Olympiad. The event was held between 21st and 30th August at the Soho Theatre in the centre of London and had restricted space, meaning fewer events than normal. Six players played the 13x13 on the Friday afternoon, with Gold going to Spain's Paco Garcia de la Banda (3 dan). Silver went to Xinyi Lu (4 kyu) and silver to Vincent Frochot (8 kyu) from France. In the 12-player Open on the final Sunday, the Gold was won by Turkish 1 dan, Bulent Tuncel. Silver went to Paco and Bronze on tie-break to Alistair Wall (3 dan). 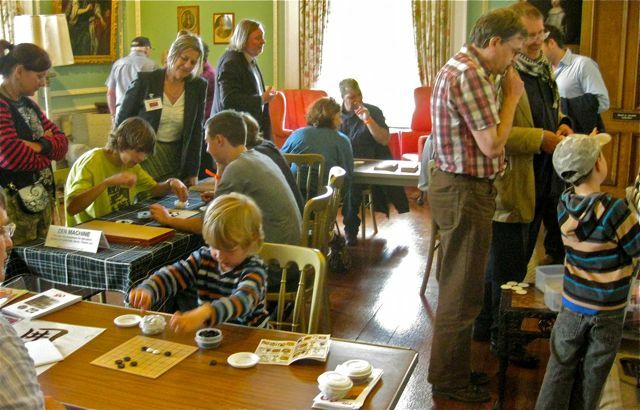 Go players took part in other games too, throughout the event, with some awards, such as Natasha Regan's Silver at Hare and Tortoise and Matthew Hathrell's Golds at Lost Cities, Continuo and Poker. 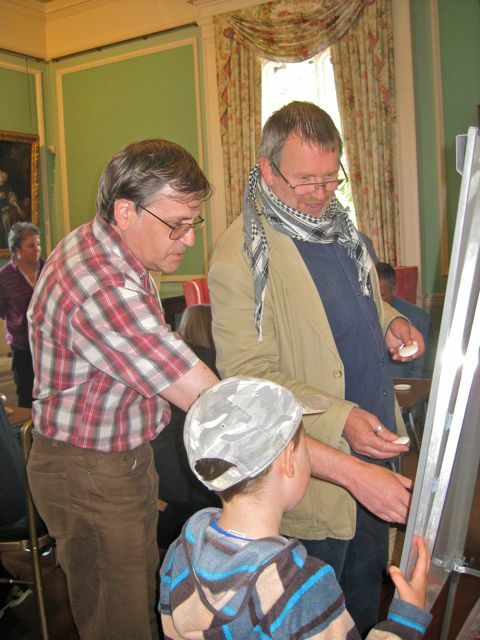 We had a stand at the Japanese Festival on the August Bank Holiday Monday 2010 at Chiddingstone Castle, demonstrating and teaching successfully many parents and children (some as young as 3). In the next room was a fascinating collection of high quality Japanese items including Samurai swords, armour, lacquerware and articulated insects. Sadly, the box with a depiction of a Samurai warrior on top of a Go board can't be photographed, but is on display when the castle is open. There were no British players winning Go Golds at this year's Mind Sports Olympiad. The event was held at the Soho Theatre in the centre of London and had restricted space, meaning less events than normal. Six players played the 13x13 on the Friday afternoon, with Gold going to Spain's Paco Garcia de la Banda (3 dan). Silver went to Xinyi Lu (4 kyu) and silver to Vincent Frochot (8 kyu) from France. In the 12-player Open on the final Sunday, the Gold was won by Turkish 1 dan, Bulent Tuncel. Silver went to Paco and Bronze on tie-break to Alistair Wall (3 dan). The European Team Tournament was held following on from the Leksand Tournament. The Netherlands were the winning team with 8 points and 15 wins. Second was Serbia also with 8 points but 14 wins. Usual winners, Russia, were third. Six teams took part. World Youth Goe Championships were held this year the tournament on Penghu Island in Taiwan. Chinese, Korean and home players dominated the event, with China winning the under-12 and Korea the under-16 titles. Anson Ng, representing the UK, won 2 games in the under-12 and Vanessa Wong won 2 in the under-16. Top european player was Lukas Podepera from Czechia who won 3 games out of 4. Roella Smith from Milton near Cambridge won this year's UK Go Challenge Finals. 29 of the best players from 5 school heats and other youngsters took part. Roella was also top girl. She beat the top boy, Barney Shiu, into second place by a half-point win in their game. I've put in a few changes to the online league site to provide for the forthcoming Individual League. People can update their status under "Update account" to indicate that they want to play in the Individual League. At the moment they'll just get plonked into the one and only division - we'll decide how the league is structured when we see how many people want to be included. Last updated Wed Sep 08 2010. If you have any comments, please email the webmaster on web-master AT britgo DOT org. 30 players attended this year's MK, held at a new time of year and held in the newly built Hub and adjacent hall at the OU. Winner was Mathieu Delli-Zotti, a French 1 kyu now living in Brighton. Also winning three were Graham Philips (2 kyu) and Steve Bailey (4 kyu). The best team was Cambridge who won 2/3 of their games. Steve Bailey also won 4/5 games on the MK-Goban, but the prize went to Paul Smith for 5/9.